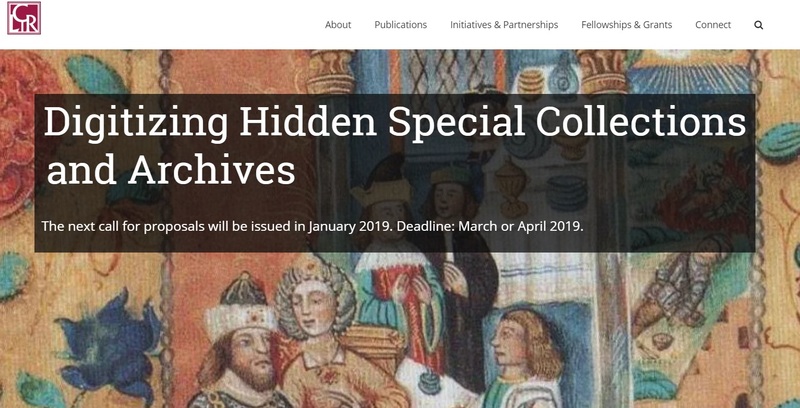 Since 2015, Digitizing Hidden Collections has awarded approximately $4 million annually to institutions holding collections of high value for research, teaching, and learning. A review panel, comprising experts from a range of scholarly and technical disciplines, evaluates proposals and recommends award recipients. In January 2018, The Andrew W. Mellon Foundation awarded CLIR funding to support three years of grant competitions for this program, in 2018, 2019, and 2020. Applications for the 2018 cycle were due by Tuesday, April 3, 2018; applications for the 2019 cycle will be due in March or April, 2019. Click here for more information and resources related to the application process. For further information, contact CLIR at hiddencollections@clir.org. The program occasionally sends announcements and news about this program and the Recordings at Risk program by e-mail; if you would like to be added to our distribution list, please click here. On Twitter, you can find the program @CLIRHC.